Appleton, WI’s Tenement are a busy beast. The two-plus-piece band (featuring numerous guest musicians) released Napalm Dream in 2011, which I gave a heavy Replacements recommendation on. 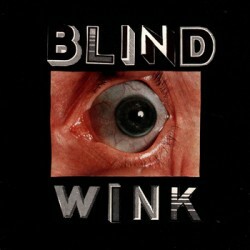 December 2011 saw the band already unleashing another record, this time the collection Blind Wink, available on varied formats from the likes of Cowabunga (LP), Hang Up (CD), and Dead Broke (cassette). With the newer record, the band explores similar songwriting—but in a very distinct and growing way. Opener “Vicious” is likely the most similar song, a noisy, sloppy romp of guitar punk that lasts under a minute. From here, the band takes their layered, noisy style and explores a new terrain, bringing in different instrumentation, dynamics, and tempos. The band drops things down a few beats with songs like “Dreaming Out Loud #2” and the piano-touched “Medical Curiosity,” and even incorporates something of a country feel to “Hey, Soozie,” with its rhythmic guitar and the steady, relaxed snare beat that carries it along. In “Lost Love Star Lust” there is a ‘90s alternarock vibe that clearly influences the guitar line and the noise ending of “Senile” is marks a distinct highlight. But, for all the musical ranges covered, the band’s identity lies in their noisy exploration of loud guitar. A song such as “The Pleasure We Get” is indicative of the concept. The song sounds a bit haphazard and has that relaxed, playing-in-the-basement feel that permeates so much classic punk. Yet, closer attention reveals a lot of detail that lies beyond that veneer. It’s part fun, part rebellion, and part boredom all combined into a single 2-3 minute burst. While it sounds good on record, there’s also a certain something behind the song that makes you just know it’s a burner when it’s played live. Songs such as this one are what continue to draw in the SST and Replacements comparisons. And then, with a rather abrupt change, they enter the ballad of “Cage That Keeps You In.” Similarly, “(Messy Endings) In Middle America,” is another strong track, built around high energy garage-pop guitar with a repetitive chorus. The song establishes a positive, driving energy that, when it hits 2:01 and that needle stops spinning, just feels inappropriate. The cohesion/sequencing of the record is a bit flawed. While the general tone remains consistent, the tempo changes can be a little jarring. Compared with Napalm Dream as a whole, the record is more varied, mixing up influences and tempos in an impressive fashion, all while sounding like the sum of their influences instead of a copycat. They pull elements and place them into an established voice. Posted April 9, 2012, 2:14 p.m.
Posted April 7, 2016, 3:38 p.m.
Posted March 25, 2016, 8:52 a.m.
Posted April 24, 2015, 1:53 p.m.